"We are looking forward to planning a wedding so that we can get married!" As we shared earlier this morning, John Duggar is engaged to girlfriend Abbie Burnett. 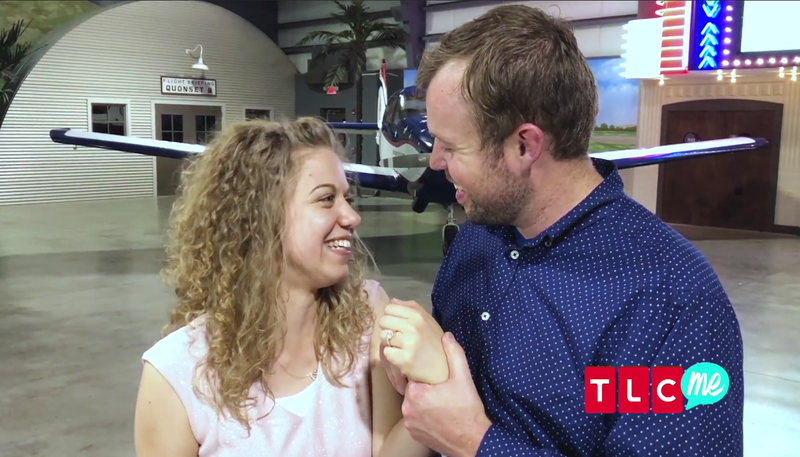 In this video below, filmed just after the big moment, the couple shares a message with fans. Congratulations to the happy couple. God bless their engagement and marriage. I feel like John David is a little more reserved, but he started this video downright giddy! Abbie seems wonderful. I hope they have a great life together. John David & Abbie I AM 100% THRILLED, WOW, JOHN I NEVER SEEN U, SO HAPPY!!!!!! Very nice. They seem so happy. They are so cute and appear to be genuine. Prayers for a long life together. Do any of the Duggar kids ever want a smaller wedding with an actual dinner instead of tons of guests with just punch and cookies? It owould be a nice change and more personal. They are an enormous family so they don't want to leave people out to have a "smaller" wedding. Who should they snub by not inviting to the "small wedding and dinner"? I agree not a 1000 guest they don 't even know. But more personal with real food. Jeremy did -- and he and Jinger said they planned to do as much after their engagement. But they were overruled by Daddy Duggar, it seemed. I agree as it seems very cheap to have just desserts since many people probably travel a long way to attend. I also find it strange to say they look forward to planning a wedding so they can get married, as if you can't have a marriage without a big wedding. I guess none of the Duggar's would ever forego a wedding for an elopement or justice of the peace ceremony so they could be married. Congratulations!! Wishing you all the best!!! It would be nice if these two eloped...they seem so in love. Why wait? i don't understand why everyone feels the need that they have to have a sit down dinner at a wedding. i have seen lots of weddings that didn't have a dinner. i don't go to wedding expecting to have a dinner. no one should. Annie and Josh had more food if I can remember correctly. I didn’t attend a wedding with a dinner until I was an adult. It’s not really done within some Christian communities like mine and like the Duggars. There is usually more emphasis put on the ceremony and less on the reception. It also won’t last for hours and hours. My own wedding was just a dessert reception and no one thought it was weird or rude. Your own opinion about something does not make it right and people will look for any excuse to be offended. If someone is upset about not being served a free dinner at someone else’s wedding that is their problem. Recognize when something is a tradition for some and not for others and get over someone doing their life differently than you. There is no right or wrong way to have or not have a wedding. There is no biblical “order of ceremony” that will ensure you are wed properly. Literally ALL wedding/reception traditions are based on cultural traditions. Not to mention couples and families have bankrupted themselves in order to throw elaborate dinner receptions. Who is that helping? The logic behind this is so flawed. The focus should be on the commitment and some (not all) couples can get caught up in the party. When my sisters and I got engaged my dad sat each of us down and gave us the option to elope just in case we felt that planning a ceremony/reception would take away from the commitment. Had I been older and more self assured I would have taken him up on the offer. Weddings can so easily get out of control. You guys think they’re just inviting strangers off the street?! They know the people who come to their weddings! 6:20, did you elope? Planning a wedding is fun (most of the time), and getting to read your vows in front of friends and family is a beautiful thing. I've never been to a wedding without a sit-down or buffet dinner included. But then I've never been to a wedding where the couple thought it was necessary to invite 1000 people. I've NOT been invited to weddings that are family only, which is fine. You can do that and have parties or receptions later for the rest of your friends. I think that's nice, when some friends or family members throw a reception later to celebrate with the couple. That's the time to serve the finger food. That's the time when you can actually talk to the couple, without all the wedding day hoopla going on. The Duggars could easily do this for any wedding. On one side of my family, there are 8 sets of aunts & uncles plus 20 first cousins and their spouses and their kids. There are about 75 of us. When a cousin gets married, there is also that side of the family. So it quickly becomes over 100. Friends are never invited. Sit-down dinners have occurred about half the time. Mostly snacks. One cousin married into a Portuguese family so there was a midnight seafood buffet. Another cousin married into a Chinese family so there were dumplings etc. I see absolutely nothing wrong with snacks. One should not be attending a wedding for a focus on food ha ha. Weddings should not be about food or decorations. Weddings are about the blessings and joy that you want to give and see from the marrying couple!! The Duggars have an after-reception party with food served for close friends. Why not just invite those friends rather than inviting acquaintances? 8:41AM - I love what you wrote. Completely agree. Anon @ 9:40 I remember Jessa saying that her Dad was inviting random strangers he met and got talking to to her wedding. I realise they are a big family but it seems to me that the other similar large families they know are aquaintances rather than close friends, so there is no need for them to be invited, or be offended if they aren't invited. The Duggars usually invite a large number of close friends and family back to their home after the wedding maybe they should be the only ones invited, if they are those close to them? Ive only been to a couple sit down dinner weddings that were catered. Most of them the family had a spread of food prepared. I had a small church wedding (150 and I think less made it to the reception). I had a 6:00 wedding so people had plenty of time to eat dinner before and we had cheese, fruits and chicken salad/ cold cut sandwiches, veggies, nuts, mints and cake. I didn’t have the money to feed everyone a fancy meal! As long as the reception doesn’t occur during a meal time just having snacks is fine! My friends who wanted longer receptions chose to pay for fancy dinners. They invited fewer people and had really long engagements to save up for it. To each his own. I just want to comment on the eloping idea. In the Catholic Church, there is a rule that you have to marry in a Church for it to be recognized by the Catholic religion as "marriage". Not the beach, not City Hall, not a backyard. Perhaps the Duggars have the same rule, a therefore, eloping is out of the question. I've been to more weddings that did not have a sit-down dinner than weddings that did. The receptions were always fun, no matter what food was served. And no, these were not weddings with hundreds and hundreds of people. The gracious guest goes to a wedding without expectations, eats what is given, and goes on with life. Anon 8:45 PM: Haha, there weren't many rules around at that time, heck Eve didn't even have to wear dresses! John David should really shave.... really... especially for such a special occasion. 12:05 I totally agree. The Duggar men in general don't wear beards well. They look so much better without them. Agree, some men suit it but John David doesn't have the 'rugged' looks it takes to carry it off, and before anyone jumps on me he is nice looking but it just makes him look dirty. He really needs a shape up for his beard...beards you can’t just let them grow. It needs to be maintained/trimmed/outlined at least once a week. At least that’s how my husband maintains his. Anon @ 6:19 I would hardly call what John Dabid has 'a beard', its more like he forgot to shave, or bad five o'clock shadow. 3:13, it’s not like you just wake up one morning with a majestic, perfectly shaped beard. They look pretty bad at first while they’re in the growing out process. I don't like any facial hair on a man. How do you kiss them with all that scratchiness happening? I agree with you 10:04, with the exception of my 1st husband. After he shaved his beard for me, I told him to grow it back! 10:04, when a beard is long enough and well maintained, it gets very soft. It’s only scratching for the first few days. My husband doesn’t shave often because he has a sensitive skin, and I think he looks just as good with his beard then freshly shaved. Oh my goodness. Please.....we all know the difference between a courtship (dating with a purpose) and an engagement. Good Grief. They are absolutely adorable together. Congratulations,John and Abbie!!! I am a huge fan of John David. In all the years that I have watched I have never seen him so happy. Congrats to John and Abbie. Also Abbie is gorgeous. I cannot wait for the big day. Ten seconds in, can anyone make out what Abbie says after John says they're engaged? "Allza ya" is what it sounds like to me, but that can't be right. I thought she said "as you see", but I might be wrong. I thought it sounded like hallelujah. She says hallelujah, pretty clear. Hallelujah is what she said. I'm not sure what she said, but "hallelujah" seem to be the winner. I think it's some sort of inside joke that only they know what it means. It almost sounds like a cross between "I love ya" and "Yowza." I don't hear hallelujah at all. She does a lot of giggling and not much talking otherwise. 6:49, why would she include an inside joke in a video they are specially making to release to fans? She could have been joking around in the moment and said something only they understand between the two of them. She says it to him, not to the camera. FINALLY!!! This is the best news for John. Now we need Jana to find someone!! Congrats John and Abbie! We don’t “need” Jana to do anything, let alone find a husband. She’s a big girl and can figure things out for herself. If she decides to go solo for the rest of her life, she shouldn’t be made to feel that’s a bad thing. If Jana doesn't want to get married she doesn't have too. I'm in 40's and I never got married. I'm so happy for John David and Abbie! I hope that they get married in September or October! They are absolutely adorable! I am so happy for them! They are a nice couple. No wonder she looked like the cat who had eaten the whipped cram in the airplane picture. I think the airplane pictures were taken after this engagement happened, although the pictures were then released in reverse order. The plane pictures weren't being sold to People. These were. It was pretty obvious that they were already engaged in the airplane pictures. She seemed too happy & too close to him, plus she had her left hand hidden. The cat who had eaten the whipped cream? Never heard that phrase before...what does it mean? "The cat who got the cream." An old saying that goes back to a time when milk was not homogenized and cream rose to the top of each bottle. There was often a friendly competition in families to see who could get the cream first and claim it. If the cat got it, he would be very happy. Now that phrase refers to anyone who looks very happy after doing anything. It's a harmless idiom, not derogatory at all. That not nice to make fun of cats. I've heard the cat who ate the Canary before, but the cream saying is new to me. I will remember it. It is a good saying! Especially if the cat is a vegetarian. Yes, all the cats who read this blog are going to be offended! I can't believe you posted that. Yeah, I’m not getting the making fun of cats comment. Odd. Awww.....so happy for you both. Congratulations!!!! John seems tranformed by this relationship. He went from not seeming interested in marriage for many years to completely in love. I didn't think it would every happen, but now he is almost giddy in love! He even looks more handsome somehow! Yes! It just took finding the right one. Joy Anna was kind of the same way. Before she met Austin, she seemed kind of disgusted by her sisters when they were in love, but she was just as gaga when it was her turn. Congratulations John & Abbie! So happy for them! I've never seen John so happy. This couple moves fast! Don't mean to offend anyone, but ..... Do Mr and Mrs Duggar gets to approve the ladies their sons choose to marry? Just like they do with their daughters? and I'm talking about the so mention 50 page questions the husbands had to answer before they were approved to courtship any of the Duggars girls I always wonder that. And if Josh and his brothers had to do something similar before the parents of their brides approved their courtship. Just an honest question no offense!! I doubt the same rule applies to the guys. It would be up to the lady and her parents to ask John David questions. That is an excellent question! The Duggar married sons have talked about how they each approached Jim Bob about an interest in their future wife and got counsel from Jim Bob and Michelle about the next steps. It seems that Jim Bob and Michelle give their blessing to continue with the getting to know you phase, but don't evaluate the future-daughters-in-law with a 50 page questionnaire. They haven't mentioned any kind of questioning at least. I think part of that is because the questionnaire delves into financial affairs and how the potential husband will financially support and lead his family. The sons then approach the women's fathers for their blessings and a vetting similar to what Jim Bob put the sons-in-law through. So far, the Duggars have known the daughters-in-law's families for several years through church and homeschooling functions. They know that the women grew up in a similar way and the women's families hold the same values. Is there really a 50 page questionnaire? I thought it was a joke that Jim Bob made up. 7:37, nope it’s for real. You could tell Jeremy was kind of😳🤨 about it when he was talking about it after they got married. Not a joke. The kids talked about it in one of the after-season episodes. Jim Bob has never confirmed or denied it, but the kids indeed outed it. Ben talked about filling it out and so did Jeremy. I always thought it was real. The Duggars and sons-in-law have been talking about the questionnaire since 19 Kids and Counting. They showed Jim Bob and Derick going over financial questions that Jim Bob had with a document and, on Counting On, Jeremy with the filled out questionnaire. The sons-in-law also talked about having to complete it during a guys only dinner and on after shows. If it is a joke, it's one that has been going on for over four years and treated by the show as truth. I don't think Jim Bob needs a "questionnaire" for his sons. He's well aware of their finances. I don't know what the parents of the young women do about vetting Duggar sons though. From the chatter on the shows I'm pretty sure Jim Bob does the questionnaire. I have always liked and respected John David. Abbie seems just great! I am so happy for them. Please delete the line where you referred to Abbie as Mrs. John-David Duggar. It is highly disrespectful and insulting to women. She has her own identity! She has a career! You’re a woman. You should know better. Many women are proud to take their husband's name. I also have friends who keep their maiden name. Women sure are hard on other women. I am proud to have a diversity of friends and would never try to force someone to keep their maiden name nor force someone to change to their husband's name. Congratulations!!! Happy for you both. You look so happy together. Dear Abbie and John, I am so excited for you. I can't wait to watch the courtship, engagement, wedding and honeymoon on TV. I can't wait to see how many children God has in store for you. I hope there are at least one set of twins. Congrats Natasha B.
CONGRATULATIONS, after checking my calendar, I see that any Friday or Saturday in October is good for me, let me know, lol. Fyi orange, brown and green are great fall colors, just a suggestion!! Abbie was very giggly, and she seemed to come across as immature. So if someone giggles on one of the happiest moments of their lives they are immature?!?!? I was in my 30s when I had my engagement. I had worked full time for more than a decade in a serious job. Even though I knew the engagement was coming, I did not know the timing and my now-husband surprised me. I had a few tears and giggles and acted like a silly teenager (which I never really was as I am a very serious person) because I was so overcome with joy. Chill out 3:53, they said she "seemed to come across as immature". Nobody ever said she was immature. Abbie and John radiated joy. She is accomplished and seems composed for a woman in her mid-20s. It's a good thing that she can relax and show how happy she is after getting engaged. She probably isn't used to the camera since she hasn't been around it as much as John David has. She probably was nervous and excited too and lots of people do giggle in those moments. She’s so happy, 12:02!!!! Give her a break please. I probably wouldn’t know what to do with myself either in front of a camera if I was older like that and finally being able to get married-I’d probably be giddy too! Love you, Abbie, LOL all you want! So happy for you too myself. Well then they could have waited a day or days to put out a video to the public. Capture the moment for family, privately. Record something for the public later, if you must. before I go to a sports center with my program I want to say congrats again JD & Abbie cant wait for you guys to be MR & MRS D.
Love, love, love this couple!! Congratulations to John David and Abbie!! You guys are so cute together! Congratulations! I have never even seen John David smile during all of the years that I have watched the show. It is so wonderful to see him so happy. He is positively giddy! Abby must be really special. I've seen him smile plenty, usually when he was making jokes in his interviews, but it really is fun to see him so happy! John David and Abbie seem so happy and in love. I am sooo happy for them. It's great to see them this way. Congratulations and the Lord's richest blessings on your life together! Wow, so many comments about how Duggars should do a wedding. Why not let them to choose? Plan your own wedding how you like it. I would hate if people tell me how to do my own wedding.